Some would say that travelling and experiencing many cultures is one of life’s greatest lessons. For Huan (Ella) Lu, completing her third year of university with JCU inspired her to continue her studies and achieve her PhD in tourism management, also with JCU. “The professors know how to teach the students very well. I feel that they understand the students’ interests and needs. As an international student, I felt I was given more than knowledge, I was also taught a specific way of thinking,” Ella says. During her studies at JCU, Ella had the opportunity to complete work experience with the Department of Agriculture and Fisheries, and the Townsville City Council. She acknowledges that this was integral for her professional development. “The placements gave me the chance to work with people from different industries and were invaluable experience that taught me how to foster teamwork within a working environment and execute strategies. It was invaluable to have the chance to work with local people and helped improve my English and understanding of Australian culture,” she says. Ella achieved a Class One Honours and completed her Doctorate of Philosophy in Tourism Management with JCU. Since then, Ella continues to confidently strive for success in her home country of China. 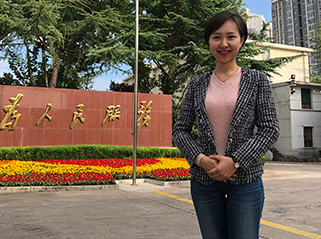 She is a lecturer of third year students with the Shaanxi Normal University and works part-time as the Deputy Director of the Cultural Relics and Tourism Bureau of Xianyang city. At the bureau, her responsibilities include promoting the city’s image to tourists. Ella’s primary supervisor for her PhD in Tourism Management was Professor Philip Pearce.